Natural gas leaks can happen anywhere. A natural gas leak can impact you, even if you don’t have natural gas service at your home or business. It’s possible for natural gas to migrate into neighboring buildings, including those without natural gas service, so even if you’re not a YCNGA customer, leaks from nearby facilities and/or pipelines could affect you. Natural gas leaks can be handled quickly and easily if you know what to look for and what to do if you find one. When you smell gas or suspect a gas leak IMMEDIATELY leave your home and call our dedicated emergency line from a cell phone or a neighbor’s phone. We respond to suspected gas leaks at no charge. Try and operate any natural gas valves. Use light switches, garage door openers, doorbells, phones or any electrical appliances that could spark and ignite the gas. Light a match, candle or cigarette. Natural gas is a clean and efficient fuel that helps heat your home, warm your shower, cook your food, dry your clothes, fire up your grill and even fuel your car. It is a domestic and abundant source of fuel and is safe when used with proper care. Natural gas is one of the safest, most efficient and reliable forms of energy available. But, like any energy source, natural gas must be used properly. In its natural state, natural gas is odorless, colorless and tasteless. Composed primarily of methane gas, natural gas is lighter than air and burns cleanly. It is lighter than air, so if released rises to the atmosphere. Since natural gas is colorless and odorless, an odorant called mercaptan is added to aide in leak detection. The great advantage of mercaptan as an additive is that it can be detected by most people in extremely small quantities, less than one part per million. Mercaptan contains sulfur and many people describe the odor as similar to rotten eggs or a burnt match. Natural gas arrived in the home during the first century A.D. in Persia. It seeped from the ground and was ignited by lightning, producing an ‘eternal flame’ that burned day and night. Seeking to take advantage of this continuous heating source – and since pipelines wouldn’t come around until the 1800’s – the king of Persia built his royal kitchen next to it. For your protection, an odorant is added to give natural gas a distinctive smell so leaks can be more readily detected. However, you should not rely on your sense of smell alone to determine if you have a gas leak. Olfactory fatigue or a diminished sense of smell in addition to other physical conditions including the common cold may lessen your ability to smell the odorant in natural gas. Natural gas is a naturally occurring hydrocarbon composed primarily of methane (CH4), which is principally found in underground formations of porous rock. The natural gas used in the United States primarily comes from North America. Natural gas contains no toxic poisonous ingredients that can be absorbed into the blood when inhaled. It is the cleanest burning conventional fuel, producing 45 percent less carbon dioxide than coal. It is the cleanest-burning fossil fuel available, producing 45% less CO2 than coal. It helps improve air and water quality, especially when used in place of more polluting energy sources. When natural gas burns, virtually no harmful pollutants are produced. Generally, if natural gas is accidentally released, it will rise and vent harmlessly into the atmosphere, dissipating from the site of a leak. Proper ventilation is important when using natural gas appliances. If natural gas collects in a confined space, it can accidentally ignite or displace oxygen. When mixed with the proper amount of air and ignited, natural gas burns with a clean, blue flame. It is one of the cleanest burning fuels, producing primarily heat, carbon dioxide and water vapor. When taken from the ground, natural gas is odorless. An odorant called mercaptan is added, making leaks easy to detect – creating the distinctive “rotten egg” smell or burnt match. If you suspect a leak, leave the area, get to a safe place and call 1-866-201-1001 or 911. Natural gas has a very high ignition temperature and will only ignite when there is an air-and-gas mixture of between 5-15% natural gas. These factors make accidental ignition or combustion unlikely. Stringent safety standards govern the exploration, production, transportation, distribution and use of natural gas. North America’s continental natural pipeline system is the safest mode of energy transportation in the world today. Nearly all the natural gas consumed in North America (98%) is produced in the U.S. and Canada. The U.S. Department of Energy estimates that, at current production rates, the U.S. has nearly a 60-year supply of natural gas. Discoveries of new reserves in unconventional rock formations like shale, tight sands and coal seams have expanded our supply to well beyond 100 years. While the number of natural gas residential customers in North America has grown by 70% over the last 40 years, customers today actually use nearly 40% less natural gas. Greater efficiency in production, delivery and usage means fewer greenhouse gas emissions. It generates electricity, runs our manufacturing plants, provides raw material for a range of products, heats and cools our homes and fuels transportation. Natural gas is energy we can count on, day in and day out. Whether the sun is shining or the wind’s blowing, plentiful supplies of natural gas are available for immediate dispatch, via an existing interconnected, efficient and highly reliable delivery system. Many natural gas appliances continue to work, even when the power’s out. Follow manufacturer directions for using and taking care of gas appliances. Keep material such as papers, rags or flammable materials away from natural gas appliances. Keep your natural gas appliances clean and maintained for better performance and safety. Install smoke detectors and maintain them properly. Have your gas appliances inspected annually by a licensed heating or plumbing contractor. Have a qualified, licensed contractor perform all gas appliance and venting repairs. Never store or use flammable products in the same room as or near any gas or heat-producing appliances. Flammable products include gasoline, spray paints, solvents, insecticide, adhesives, foggers, varnish, cleaning products and other pressurized containers. This will reduce the risk of flammable vapors being ignited by the main burner flame found in all gas appliances or the pilot flame found in many gas appliances. If a burner flame is yellow, large and unsteady, the appliance needs to be inspected immediately by a qualified professional. Never store anything near a gas appliance that might interfere with normal appliance airflow. Ensure that gas appliance intake and exhaust vents are clear of obstructions. When operating vented decorative gas logs, open the fireplace/chimney damper completely. Never use your oven, range or outdoor barbecue to heat your home. These appliances are not designed for this purpose. Install a Carbon Monoxide (CO) detector on each level of your home. 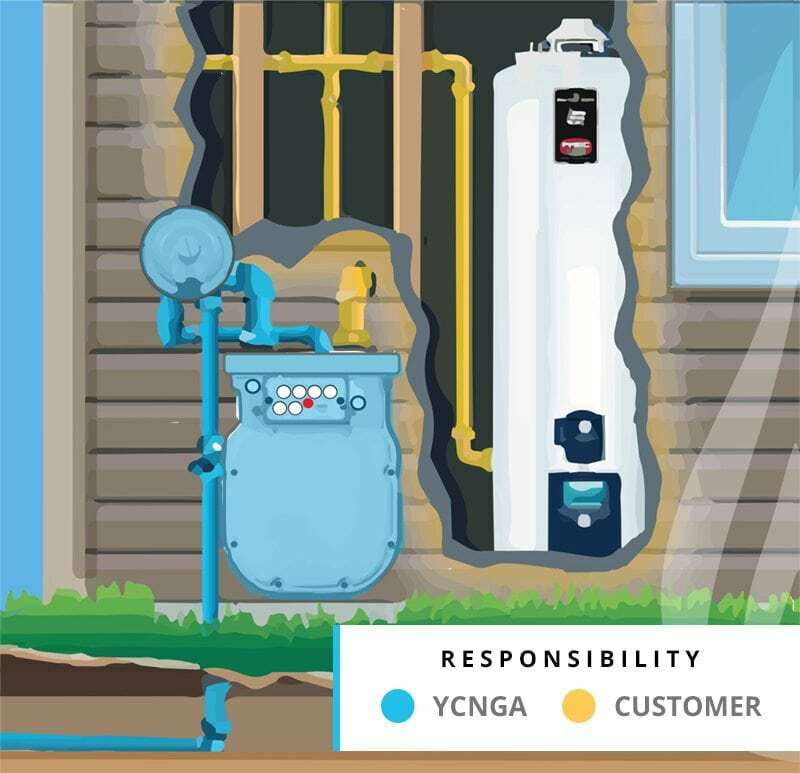 YCNGA owns and maintains all piping from the distribution line (located along the street or utility right-of-way) to the meter at your location. Any piping that runs from the meter to your appliances is customer-owned piping and must be maintained by you. This piping is part of the building or property, much like your plumbing or electrical wiring, and as such requires periodic maintenance. Whether house piping or buried piping running to an exterior building or appliance, all maintenance and upkeep is the responsibility of the home or business owner. Natural gas piping above and below the ground can deteriorate with age causing potentially dangerous situations. For safety, have your gas pipes inspected periodically for leaks or signs of corrosion. If an unsafe condition is discovered, have repairs made by a licensed heating or plumbing contractor. Buried gas piping which is not maintained may be subject to the potential hazards of corrosion and leakage. For your safety, all buried piping should be periodically inspected for leaks. If the buried piping is metallic, it should also be periodically inspected for corrosion. If an unsafe condition is found, the gas piping will need to be promptly repaired by a licensed heating or plumbing contractor. When digging near buried gas piping, the piping should be located in advance and digging done by hand. Gas pipelines are buried underground and are not often affected by wind, rain, or storms. However, severe weather including summer storms, hurricanes, and winter ice could damage your appliances or affect your gas supply. Natural gas lines require you to take no special precautions. There is no need to turn off your gas meter. Many natural gas appliances will continue to operate safely without electricity. Some may require that you manually light the product, and this should be done according to the appliance manufacturer’s instructions. If you have any resulting storm damage, check natural gas appliances for possible damage or leaks. If you smell a strong sulfur odor, leave immediately and call York County Natural Gas Authority at 1 (866) 201-1001. If no smell is present, operation of natural gas appliances should be safe. If a natural gas generator was in use for several days, the oil should be checked, and changed, if necessary. During clean-up and repair, avoid damaging underground utilities by calling SC811 toll free at 1 (888) 721-7877 before digging. Gently brush away any snow or ice that has accumulated around the meter, regulator vent and any other outdoor piping. Be sure all gas appliances are installed, adjusted and operating properly. Clear the snow or ice using a broom or by hand – not with a shovel. Do not push or pile snow around your meter when plowing, snow blowing, or shoveling. Clear a path to your meter so gas employees and emergency responders can access it in an emergency. Clogged vents may cause your appliance to shut down or malfunction, and create a hazardous situation such as a build-up of carbon monoxide. Falling snow and ice can cause serious damage to your natural gas meter or regulator. Shut off the natural gas valve at each natural gas appliance. Do not change the valve settings on the natural gas meter or piping to the meter setting. If you notice a strong gas odor (similar to rotten eggs), or if there is other evidence of a natural gas leak, do not enter the building or area. If you smell the “rotten egg” odor of natural gas inside your home, leave immediately. Avoid open flames or anything that could spark, including cell phones, lights, garage doors, motor vehicles, power tools, electrical equipment, etc. From a safe place, call 911 and York County Natural Gas at 1 (866) 201-1001. Stay nearby until a gas company representative arrives, or leave a note on you door stating where you can be reached. Don’t return until you receive an all-clear indication. After returning home, customers who believe their natural gas appliances have been damaged by water must have the equipment inspected and serviced by a qualified contractor before York County Natural Gas Authority can restore your natural gas service. Do not attempt to place natural gas appliances back in service by yourself. A licensed plumber or contractor will check, clean, repair and pressure test all gas pipes, which may have been clogged with mud or debris. If water levels were enough to cover the natural gas meter, call the gas company at 1 (866) 201-1001 to check your meter and regulator before using your natural gas system. Flood waters may have shifted your home or caused other stresses to the gas piping, possibly resulting in a natural gas leak. Take care when removing fallen trees or grinding tree stumps. Fallen trees can damage buried underground utilities, creating a dangerous situation. South Carolina law requires everyone to always call 811 before beginning any excavation or demolition project. From fueling our cars to heating our homes, natural gas and oil are part of everyday American life. Pipelines are the safest and most efficient way to transport these products across our nation. It is important for individuals living or working near pipelines to recognize pipeline locations in their area, be alert for unauthorized activity or abnormal conditions near pipelines, and know how to react in the unlikely event of a pipeline leak or emergency. Natural gas pipelines are generally located along roadways, private property and in corridors or rights-of-ways. . Markers are placed at regular intervals, where needed, to indicate the presence of a pipeline. These yellow markers are visible where pipelines intersect streets, railroads, streams or rivers, and in heavily congested areas. A pipeline right-of-way is a strip of land over and around a pipeline where some of the property owner’s legal rights have been granted to the pipeline company for inspection, repair and maintenance of the pipeline. A right-of-way, or easement, agreement provides a permanent, limited interest in the land that enables the pipeline company to operate, test, inspect, repair, maintain, replace and protect the pipeline on the property owned by others. Generally the pipeline company’s rights-of-ways extend 25 feet from each side of a pipeline unless special conditions exist. Right-of-ways must be accessible at all times to company personnel. Any object that hinders a right-of-way is an ‘encroachment’ and may be removed from a right-of-way without compensation or replacement. Refrain from placing any objects including, but not limited to, fences, sheds, locks, structures, ponds, pools, paths, trees, shrubs, etc., on a pipeline right-of-way. Leaking gas from any damaged pipeline or gas meter could cause a fire, explosion, property damage and serious bodily injury. Damage to a pipeline can include a gouge, dent, nick, scratch, puncture or even contact with the marking tape and should be reported immediately. Start an engine or use any device, including a telephone, which could cause a spark. Turn electrical devices on or off, including light switches. Safely abandon any motorized or powered equipment or vehicles. DO NOT use or turn off any equipment that could cause a spark. Motorized or electrically powered equipment or vehicles may create an ignition source if a gas leak is present. Gas leaking from a plastic pipe can create static electricity that can ignite the gas. CALL 911 promptly after evacuating the area if the damage results in a natural gas leak that may endanger life or cause bodily harm or property damage. DO NOT attempt to control the leak or repair the damaged pipe or meter. Leaking natural gas can migrate underground. Avoid parking emergency vehicles on or near manhole covers or storm drains. Even if you do not suspect a leak, but you suspect damage to the pipeline, you should call YCNGA at 1 (866) 201-1001, 24 hours a day, seven days a week. Keep yourself protected. All York County Natural Gas maintenance employees wear a nametag and identifying uniform. Do not allow anyone but official YCNGA employees to fix or operate your meter.